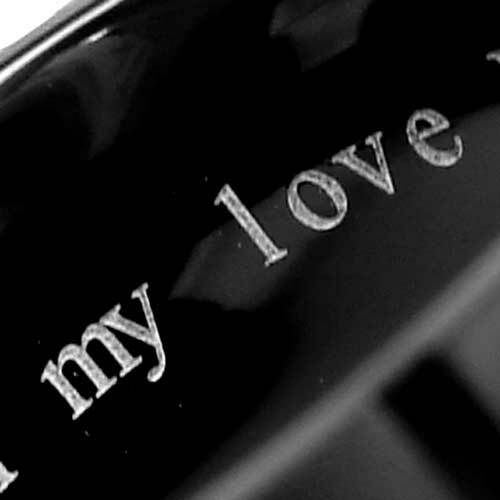 Personalised Inner Ring Engraving : LOVE2HAVE in the UK! Our personalised inner ring engraving service. Please note that while we are happy to offer an engraving service to our customers, we do, however, sometimes use third-party services. If you still wish to choose this option, please be aware that the delivery of your jewellery may be delayed by up to two weeks. Please specify your requirements in the comments box at check out. If you are buying more than one engraving, then enter the quantity in the 'Quantity Box' during the cart checkout process as they are £30 (UK Pounds sterling) each. If you require a particular font, please let us know, and we will try and accommodate - it is not always possible. 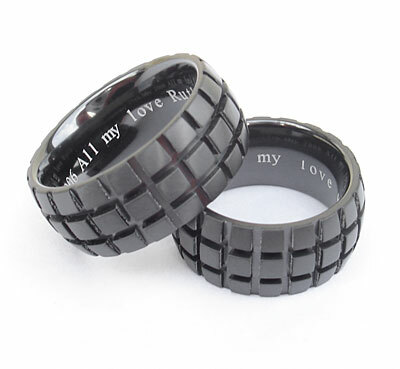 Please note the laser engraving pictured is only available on some of the titanium rings other items are hand engraved. The black you may see on some of the images is just the way the light has caught in our pictures. The engravings are laser engraved with no black inlays - it just looks that way. In areas such as a logos or bold graphic, there is a slight pitting to the surface - this makes an excellent contrast but its all natural titanium or zirconium in colour.